Every Tuesday during school term, 10.45 a.m. to 11.15 a.m.
For toddlers and pre-school children with their carers. Birling Bairns is a Scottish country dance session for adults and children to dance together and enjoy themselves. We hope that by adults and children dancing together that our little ones will learn a few early dance skills, become aware of rhythm and music, will improve their attention and listening skills and will have increased self confidence. They will also gain an awareness of left & right and very early counting. Socially, it will help them gain spacial awareness and learn about turn taking. They will learn all this in a fun and friendly environment with everyone participating and making the little ones feel safe & secure as they dance along holding their adult's hand. An adult can bring along more than one child, as many of the games and dances can be enjoyed holding a child in each hand. Birling Bairns meets at 10.45 a.m. – 11.15 a.m. in St Vigeans Church Hall on Tuesday mornings during term times. Bring along shoes that are soft and comfortable to dance in and a drink of juice for in-between dances & games. There will be a small fee per family. 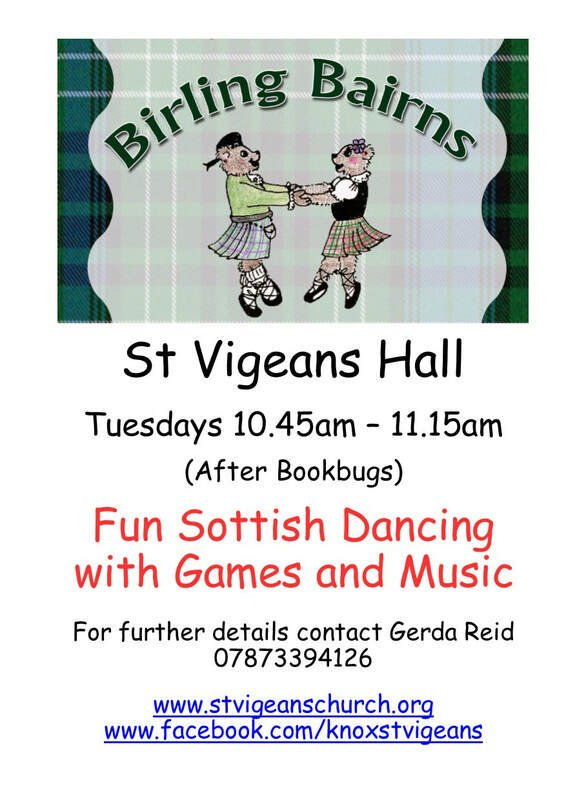 If you would like to take part in Birling Bairns, either with a preschool child or to come along and help families to learn a few dances, please get in touch. On holiday for three weeks. Resumes Tuesday April 30th, 2019.